Maynard James Keenan of Tool and A Perfect Circle said, "Looking forward to playing material from the new A Perfect Circle release at Northern Invasion. Bringing new songs to life in a live setting is always exciting." Dean DeLeo of Stone Temple Pilots commented, "Stone Temple Pilots are beyond thrilled to be playing Northern Invasion 2018. We are back! It's going to be a killer weekend of great music—great fun." 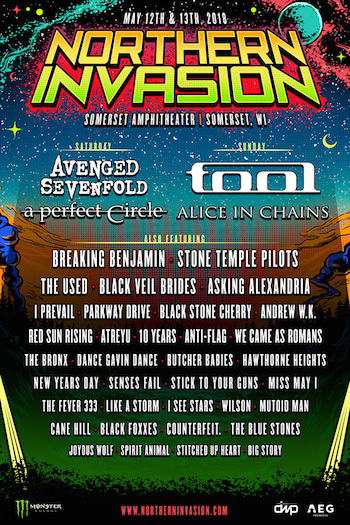 "We spent a lot of time listening to our loyal Invasion fan base over these last several months to create a lineup that celebrates some of the rock legends along with delivering on our reputation for inviting the hottest up-and-comers in the genre," said Joe Litvag, Executive Producer of Northern Invasion. "Having heroes like Tool, Avenged Sevenfold, Alice In Chains, and Stone Temple Pilots matched with new sensations like Parkway Drive, Black Veil Brides, and Red Sun Rising, I think the fans will respond well. It's going to be an unforgettable weekend!"